Entries categorized "Marathon Training Program"
Cannot believe how strange it was to type Oct. in the subject line....doesn't seem right.....but it is! Congrats to Ramki and Jeff who conquered Berlin and a huge AWE to Ramki's daughter who without much training (or at least that's what we're being told!) stormed thru the finish line 8 minutes before her dad...Congrats! Looks like long miles are on the agenda for many in our group. Please reply all and let us know what your Galloway schedule is calling for. Some of you may need to start before the regular 5:50 meeting time. I (Sandi) will be running the Maine Half in Portland, ME on Sunday...cooler weather and rain...oh well, can't have everything! You know the meeting place....so....Have fun, play nice and run safe! Happy 1st Day of Fall!!! Welcome back Jeff Odell from the Air Force Half...congrats on being the 6th highest fundraiser for The Fisher House charity!! Good Luck and safe travels to our Berlin bound runners...Ramki and Jeff Downey! So excited for both of you and can't wait to hear stories, see pictures and the medal!! For the rest of us, it's back to the regular meeting place at Temple Terrace Elem. School at 5:50 am. Please "reply all" to let us know if you need to start earlier and what your Galloway scheduled miles are. Have a great rest of the week and stay warm! Janet will be leading the group this weekend so please meet her in the parking lot at 5:50 a.m. and let her know what miles you need or will be running. It's sometimes a trick to get everyone covered, so be kind and REPLY ALL as soon as possible. I will be running early, 5 a.m., and it's going to be my last run in TT for probably the rest of October. MER is still on injured reserve though she is making a great recovery and hopes to be happily Goofy soon. There are no Goofy/Dopey back to back miles this weekend. Due to scheduling and traveling schedules, our MCM runners will be heading out for their 23+/- miles. This is a week early by the schedule, and will give 4 weeks before the actual marathon, which works very well. But not so well if your marathon is later. The weather is changing, or so I have been told, I can't really tell that much difference myself. You still need to optimally maintain your hydration, not just with water but with electrolyte beverages, starting at least on Wednesday and carrying through. It's still pretty warm out there, so don't let your guard down, especially if you are adding miles. REPLY ALL please and let us know who will and won't be there this weekend. And take it easy out there and have a good run. Hello friends-I'm back from my training in Clearwater. Did you know that 80% of ACL repairs are done by Physicians that do less than 10 a year? Yikes-if you ever need surgery, make sure your physician knows what they are doing! Anyway, I have 9.5 miles to complete. Was hoping there would be a kind soul that would meet me at 5 to do the 1st loop and the rest of you guys would meet us at the college at 6 to do another loop and then some. Let me know what you think. And so another week comes to an end. I have yet to have a day off since I have been at VBS and having to rewrite each day’s skit as I am directing them. They were originally just to be shown as a video but we have kids that wanted to act them out as usual. Only problem is the science experiments have to be figured out as to how to do them for real. Fun fun fun! Just like this week’s magic mile!! Yes, it is that time of year ago where we have a magical experience running the mile for time. It keeps us honest and gives an approximate time that we “should” finish our races in. This is an integral part of the Galloway program so we are going to embrace it and have fun!! This week is 4-5 miles for Dopey, Goofy and the regular marathon. We will be starting at 5:50 at the Rec Center, remember it is on Whitewall Ave. Reply all to see how wants, needs or desires more miles! Looking forward to seeing everyone! Tampa Galloway OFFICIAL SEASON BEGINS! It was wonderful to see many of you at our first kick-off event of the "official" season last Sunday at the Running Center. Thanks to Bill Davison and crew for again opening their store to us and continuing to be supporters of the Galloway training program. The Running Center offers an on-going 10% discount to Galloway members, just mention that you are a member! THANKS to many alumni for already signing up for another season....you are the lifeblood of our group...without you, we wouldn't exist...THANKS! WELCOME to our newest members: Harry Carlock, Janet Carter, Megan Edmonds, John Garcia, Andrea Gonzmart, Mary Ann Keller, Angela Martinez, Sheada Pratico, and Dahlia Suarez--who ran with the group several years ago! We look forward to running with, getting to know you and helping you achieve your goals and dreams! While there is no "deadline" to sign up for new or alumni members, the membership roster is submitted to Runners World in mid-June...if you haven't signed up by then, there is a possibility your subscription (which is included in your membership fee) will expire. You will also lose valuable training time and weekly emails from your group leaders and me! Sign Up Now!! The earlier you take walk breaks, the more they will help you! 13 min./mile run 1 min./walk 1 min. 12 min./mile run 2 min./walk 1 min. 11 min./mile run 2:30 min./walk 1 min. 10 min./mile run 3 min./walk 1 min. 9 min./mile run 4 min./walk 1 min. 8 min./mile run 4 min./walk 35 sec. Paces and times are adjusted for weather....heat and humidity. LETS GET STARTED! Meeting time and place is 5:50 AM in the parking lot of Temple Terrace Elementary School, 124 Flotto Ave. in Temple Terrace, FL. The school is directly behind the Fire Station and Public Library on Bullard Parkway (Busch Blvd. becomes Bullard Parkway at 56th Street). Please be on-time so we can pair you up with a group! New members will run what we call the "college loop" which will be close to 4 miles by the time you return to your car. If you have any questions, please let me know....looking forward to seeing everyone on Saturday...please bring a friend or two to give us a try! Galloway members just need to mention they're a part of the group to receive the specials. Also, for the rest of the month of May, all nutritional products are Buy 2, Get 1 Free for the group....so now is a great time to stock up! Finally, make sure group members sign up for the Galloway Cash Back Rewards Program: every $200 spent earns $20 back for future store purchases. Tampa Galloway 2014 "Official" Updates and Registration!! It's almost time to "officially" start training for the 2014 season! Hopefully the following information will answer most of your questions....after reading this info, visiting www.jeffgalloway.com and http://www.tampa262.com/ , you still have questions about the program, please let me know! Registration is now open for the 2014 Tampa Galloway Training Program! Participants signing up for this six month program will be training for a full or half marathon to be completed by Dec. 31, 2014. There are many Florida based full and half marathons in Nov. and Dec.....We can help to choose the best one for you! For many years the Tampa Galloway program has been meeting at Temple Terrace Elementary School in Temple Terrace. During the 2014 season we will continue to meet at that location for Saturdays each month. The other Saturdays will find us exploring the South Tampa and Upper Tampa Bay Trail areas. Locations will be communicated at least two weeks in advance and be communicated via Sat. morning announcements, emails and posted at www.tampa262.com! All Saturday runs begin at 5:50 AM! Season Kick-Off & Meet Jeff Galloway! Join us for an information session following a 5k run with Jeff Galloway! Sat., May 24th at 5:50 am! We will meet in Temple Terrace Elementary School parking lot, 124 Flotto Ave, Temple Terrace, FL 33617 and complete a 3-4 mile run. The following pace groups will be offered for you to run with: 1:1, 2:1, 3:1, and 2 --4:1 groups ....we will review the pace per mile for each group on Sat. May 24th. For those new to the Galloway run/walk/run method of training, the first number in the above ratio is the run minutes and the second is the walk minute (2:1 equals a 2 min. run with a 1 min. walk). As the Tampa Galloway Program Director, I will send a weekly email to all registered participants. You will begin receiving weekly emails from your pace group leader once you have been assigned to a pace group (usually by week 3). You can also visit theTampa Galloway website at www.Tampa262.com for weekly updates! The Tampa Galloway Training Program is open to anyone who is interested in training for a full or half marathon. If a marathon is your goal and you can currently run/walk three miles at a 1:1 pace (run one minute/walk one minute), we'll get you to the start line of your chosen event in six months! Looking forward to a GREAT 2014 season!!! Happy 4th of July Galloway Runners!! Whether you are attending a parade, enjoying fireworks, cooking out, celebrating with family and friends or running in events, I hope all of you have a wonderful holiday! Our Galloway training season is well underway! It appears everyone has settled into a group, is receiving emails from group leaders, has received their book, shirt, training schedule(s) and is experiencing the exhilaration of completing more miles than you ever thought possible! It's amazing how quickly those miles go when you have friends supporting you every step of the way. If you have not received your shirt, please respond to this email with your desired size...I will have shirts on Saturday. 5. It improves your overall training experience…and makes training more FUN! If you will miss a Saturday run, please let your group leaders know by replying to their weekly emails. · Arrival Time – Please do your best to arrive at 5:50 am. This allows time for announcements and to answer questions with the goal to actually start running at 6 am. You don't want to be the person your group is waiting for! · Bring a good Attitude - If you don't have a good attitude, we'll try and provide one...or send you home (just kidding!) A good attitude in what we do helps lead to a good outcome in whatever we are doing! (quote by Sandi)! · Water Stops – Thanks to everyone for providing hydration and to our wonderful hydration team for putting those coolers out each week. You might be tired of me thanking them but...I am really grateful when I get to those stops!! 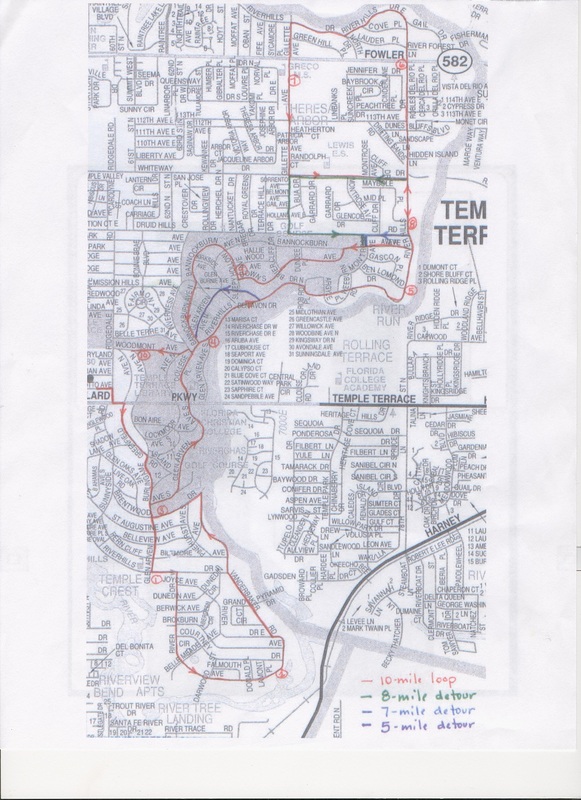 · Route and Safety Information – As everyone is becoming familiar with the course and feeling at home on the streets of Temple Terrace, please remember to: Run on the left side of the road facing traffic. When you see/hear a vehicle approaching from the front or back...alert your group with a "car up" (the car is heading toward you) or "car back" (the car is approaching from behind-hopefully in the other lane) warning...then get into single file on the left side of the road until the vehicle has passed. We do not want collisions with vehicles, bicycles, other walkers or runners. We want your running experience to be fun, enjoyable and safe. I feel like the airline attendant whose job it is to ensure your safety...although I like it when they are nice and bring me cookies and a Coke Zero too...I realize their primary job is safety. Running on the left side of the road facing traffic is an extremely important safety issue...it is not an option. · Learning "Stuff" (how's that for a technical program director term?!) - We will discuss several different topics over the training season. "Stuff" will be covered in a weekly email from me and during your group runs. · Questions and Answers - something really got you bewildered? Ask away, there are no dumb questions. · Equipment – This was mentioned in last weeks email but in case you need a refresher, some of the equipment you may consider, in addition to your running shoes and clothes are – fluid bottles/fuel belts, safety lights, flashlights/headlights, watch, the "stick" or foam roller. · Post Run Refreshments - You might want to bring a post run refreshment/or food to aid in your recovery. You do not need to bring food to share unless you really want to. One of the best recovery beverages is chocolate milk! · Towel and change of clothes - As you know we don't have a changing area in the school parking lot and you may have a need to get out of your running gear, I know I do! You will probably come up with a creative way to change without alerting the neighbors...this will be up to you (and maybe your running friends - especially if you want to go out for breakfast)...getting out of your sweaty clothes is a good idea. · Breakfast - Some groups like to meet for a bite to eat after the run. This is not a requirement but if you can join your group or another group for some post run food...go...this provides a great chance to your continue the stories! · Pacing/Intervals - Your long runs should be at an "easy" pace...a pace at which you can carry on a conversation while completing your run. Most runners will be a bit out of breath when they start, but after you get going, your breathing should be regulated, and you should NOT be "huffing and puffing". If you feel like you are not in the right group, please talk with your group leader or me to determine if another group would be a better fit for you. · Injuries - There are always questions on injuries and aches/pains. First, the disclaimer - we are not doctors! But, with that said, you may encounter an injury during training. Most will be aches/pains/strains - and it will be important to address them early. Treat your injury like training – be proactive - icing/strengthening/resting. If your issue persists, please see a doctor early to get a professional diagnosis. · Following the Schedule - The schedule is designed to allow some leeway, however, do your best to stick to the mileage and days as much as possible. If you can't run on Saturday but can on Sunday, that is fine. · Fluids / Eating - As you know, the summer days are hot and humid therefore, make sure you are taking in as much fluid as you need and this will vary for each person. Dehydration will likely have the biggest impact on your weekly long run performance. You may not feel thirsty, but, your body needs the fluids - if you wait until you are thirsty, it may be too late to help you with finishing your run and you will struggle. For example, a 2% weight loss from fluids equates to a 6% slow down on your speed. And, if you start to feel a headache or dizzy (during or after a run) you are most likely dehydrated - this is a bad thing. Stop and take in fluids! Hopefully you have made it to the end of this email and are ready to hit the road and run! You know the time and place, Sat., 5:50 am in the parking lot at Temple Terrace Elem. School....hope to see you there! Sorry for sending another email, however, just received this important info for the Space Coast Marathon weekend. As you can see, due to tremendous early registration, they have split the start times for the half and full which resulted in raising the cap registration for each event. They have not mentioned a sell out but with a strong early registration, the possibility exists. If you haven't registered and are training to run either of these events, you may want to consider registering now! Don't be left out by a sell out! On another note: Did anyone pick up the first aid kit that was on the ground behind my car last Saturday morning? If you have it, please bring it back on Saturday. Hopefully it is never needed for anything major but we do like to have it available for the minor issues like blisters, falls, scrapes, etc.